Last year around this time we asked you the same question with different responses. Solid Tights and Leggings were in the lead with 43% and patterned Tights and Leggings followed with 39%. No one chose ankle or knee socks. Now we want to know if you wear sparkle hosiery! Tell us in the poll and comments. Before I get started with today's post, I just want to thank Stocking Vixen for picking up where I left off and discussing different ways to wear shorts with tights. Check out her post here, it has some great tips! This past weekend I was outside a lot - off on a day trip and then hiking. It's still a tad too windy for me to break out my skirts, but I could definitely smell Spring in the air. In preparation for the official beginning of Spring, I've been trying to decide which knee socks I'll try out first. 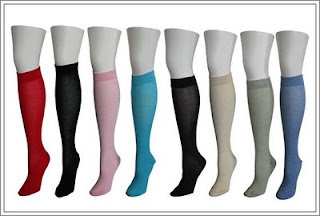 My first choice, I think will be one of these great solid color knee socks. My only dilemma is what color to choose. Super super soft and available in 8 colors, these are only available in limited quantity. I'm currently leaning towards the rusted blue or green, which I think would go great with an ivory dress that I have. I also love our Herringbone knee socks. Available in 4 basic colors, these knee socks are also currently on sale. You can buy one pair for $16, or THREE for $19.99! An older sock that I already have and am looking forward to wearing again are our Ophelia footless socks. Perfect for layering with a colored ankle sock or a printed sock or tight, these are a great choice for warm days with a slight chill. For my nights on the town, I'm thinking about these glitter knee socks. Black with gold lurex stripes, these socks are also a great deal at just $6.99 a pair. Another great deal right now are our Argyle Knee Socks - great for these last few days of winter as we transition into Spring. Available in three color combinations - we currently have them at buy one for $10 or buy THREE for $20. Finally, I want to bring up these great ankle socks, only available in limited quantity. These nylon socks are just $3.99 each and the perfect accent for Summer.